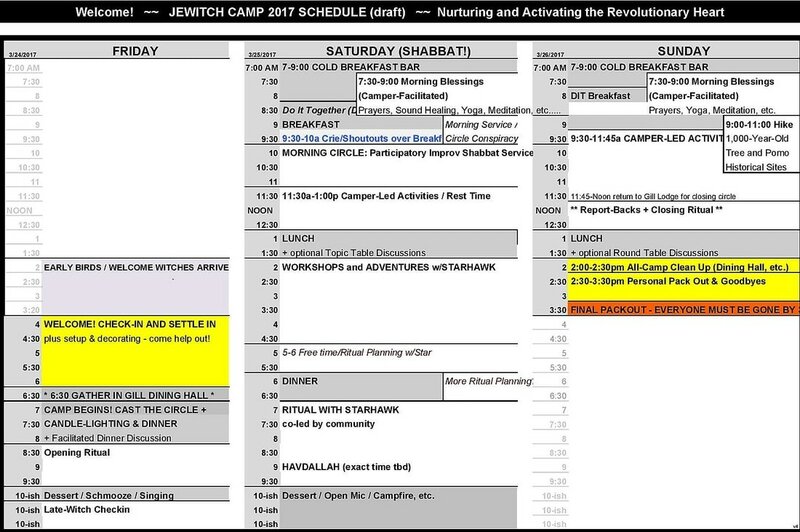 Inspired by Harry Belafonte's concept of the "Rebellious Heart"
Creative, cooperative, and experimental: JeWitch Camp: Jews, Pagans and those who love them, a DIT (Do It Together) weekend gathering. Learning from and with each other and Starhawk. We celebrated Shabbat, co-created eco-feminist rituals with a focus on tikkun olam (repair of the world), explored our theme and deeply connected with ourselves, each other, and all that is sacred. ​Camper-led activities, deep discussions, and powerful magic went hand in hand with relaxation, singing, yummy food, and laughter. We shored up our skills as activists, challenged ourselves and each other all the while supporting each person's individuality and taking stands against oppressions of all kinds. JeWitch Camp values and strives towards inclusiveness; respecting self-definition; whether about one's beliefs, identities, or practices. People of Color, those of Mizrachi and/or Sephardi descent, those who identify as LGBTQ (including those who identify as gender non-conforming), those who have low-incomes, as well as people from all religious paths and people living with disability are vital and welcome members of the community. There were opportunities to hike and learn about the Native history of the Coast Miwok and Pomo people who first inhabited the sacred land where camp is held. We communed with 800 year old Bay Laurel trees, Redwoods, and Madrones while building community. If this calls to you, you belong. We welcome you to join us next time.